Here are few common birds of India. One of the most widely distributed species of owls, Barn owl is a nocturnal bird which is easier to locate by its loud hissing-like calls, audible just after sunset. This almost white owl with a heart-shaped face gets this name from roosting in cavities, abandoned barns and other desolate buildings. Distribution: spread across the world from South Asia to Africa, and Europe to America. Habitat: in open forests, tree hollows, caves, and buildings. Diet: mainly rodents like rats and mice, hence commonly found near grain silos and apartments which have abundant rats running around; also feeds on lizards, frogs, insects and small birds. Barn owls look quite different from other owls as they lack ear-tufts and appear almost beak-less. Unlike other owls, Barn owls don’t hoot, rather produces shrill screeches. Did you know that these adorable “love-owls” mate for life? Listen to its sound by clicking here. Mynas are one of the most common garden birds of India, which are easy to identify because of its distinctive yellow-patch around the eyes which extends to its beak. Common Myna is widely popular in Indian culture, appearing in Vedic and Buddhist texts; often paired with rose-ringed Parakeets (Tota), probably because both birds are vocal and are capable of mimicking human sound. Other names: Common Indian Myna/Mynah. Distribution: widespread across South and South-east Asia. Habitat: open woodland, cultivation and around human habitation. Diet: these omnivorous birds feeds on insects, reptiles, small mammals, seeds, grain and fruits and discarded waste from human habitation. Common Mynas mate for life and build their nests in tree hollows as well as the walls and ceilings of buildings, making these birds a nuisance to humans. Although introduced in Australia and New Zealand as a natural pesticide against locusts and beetles, Mynas have become invasive and a threat to their crops and local birds. This merrily chirping songbird is a common resident in urban gardens, which has been immortalized by Rudyard Kipling in his “Jungle Book”. Common Tailorbird gets its name for ‘sewing’ its nest- the edges of a large leaf are pierced and sewn together with plant fibre or spider silk to make a cradle in which the actual nest is built! Habitat: deciduous forests, scrublands, mangroves, open woodlands and gardens. Diet: being insectivorous, it eats mainly insects found in flowers, which aids in pollination of Mango flowers. These cute little birds are a delight to watch in the garden, hopping around for food with their usually erect tails. Tailorbirds are often sighted in pairs, and are quick to fly away in short, darting flights. Listen to its melodious sound by clicking here. Coppersmith barbets are cute little dark-green birds with a brilliant red forehead, patched breast, bright yellow throat with yellow eye-ring around red-margined eyes. Also, did you notice some whiskers growing around its beak? This colorful hard-to-miss bird gets it name from its rather loud metallic tuk…tuk…tuk sound, like that of a copper sheet being beaten. Distribution: spread across the Indian subcontinent and parts of South-east Asia. Habitat: found in gardens, groves and sparse woodlands; since dead wood suitable is suitable for nesting and roosting. Diet: mainly fruits and some insects, especially winged termites. Coppersmith Barbet chiseling a hole in the tree. 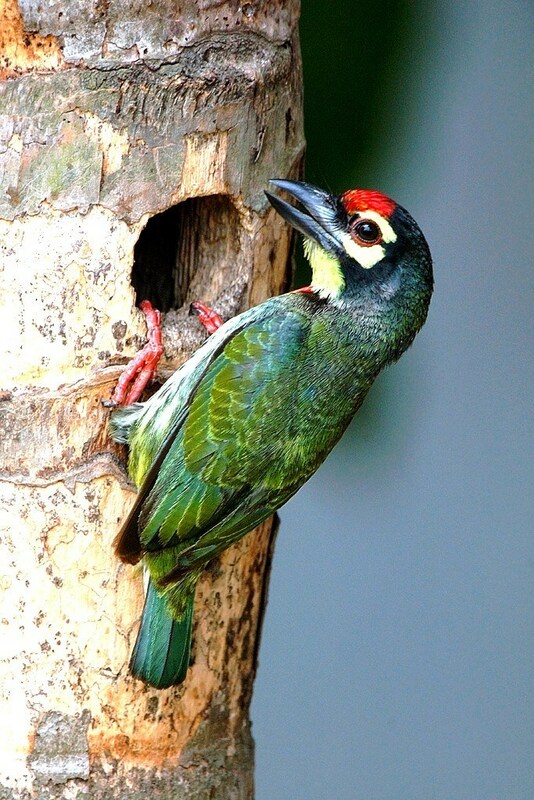 Like other barbets, they too chisel out a hole inside a tree to build their nest. Coppersmith barbets are fond of basking in the early morning sun, hence can be easily spotted sitting on bare wooden branches in your garden, during daylight. Resembling like a more beautiful and colorful version of a crow, Greater Coucal is a large bird with a long tail, chestnut-brown feathers and vampire-like red eyes. The deep resonating calls gives away the location of this relatively shy bird, often sitting concealed in dense vegetation. Distribution: these non-migratory birds are residents of South and South-east Asia. Habitat: found in wide range of habitats, from dense forests to open cultivation. Diet: mainly insects, small vertebrates, bird eggs, nestlings, fruits and seeds. Although belonging to the Cuckoo family of birds, Greater Coucals are non-parasitic birds (they don’t lay their eggs on a host bird’s nest, rather raise their own young ones). They are often spotted in morning, sun-bathing with their wings spread out. Listen to its deep echoing calls by clicking here. This entry was posted in Garden Birds, Garden Wildlife and tagged barn owl, Common garden birds of India, common myna, common tailorbird, coppersmith barbet, greater coucal. Bookmark the permalink.